We offer our client a precise quality range of corn wet milling plants. 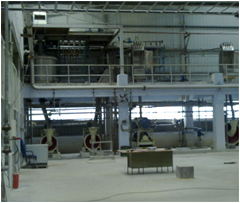 The machineries used in corn wet milling plant are robust in construction. It has a best workman ship with fine finish and requires less maintenance can able produce good quality output. In corn wet milling plant, wet milling is to feed material that is steeped in water with sulphurdioxide to soften the seed kernel in order to help separate the kernels various components. Corn wet milling is the process by which we refine corn to manufacture products that are used by millions of people around the world each day. Corn is most common and is used to make high fructose corn syrup, food starch, ethanol and animal feed, stabilizers, thickness and emulsifiers for the food industry. Every part of every kernel is used in some way to produce the quality ingredients that our customer wants. Our corn wet milling plant are appreciated and demanded in the market for optimum performance, which ensures complete customer satisfaction.